The Civic Platform, seen by some as one of Russia's key opposition parties, has lost its leader for the second time in several months. Irina Prokhorova has announced that she is to leave her post due to a failure to agree with the party's position on Crimea. The Civic Platform, one of Russia's key opposition parties, has lost its leader Irina Prokhorova. According to Prokhorova, sister of billionaire and party founder Mikhail Prokhorov, the decision has come about as a result of her personal position on Crimea. "The majority of the party's regional divisions support Crimea's unification with Russia. As an intellectual I cannot agree with this position and allow the party to break up," she explained at a Civic Platform session last week. "The situation is very difficult for me,” said Prokhorova, a literary scholar, editor-in-chief and owner of the magazine and publishing house Novoe Literaturnoe Obozrenie. “I am torn between feeling and duty. Lately I have not been able to speak openly about my position, since by doing so I would be speaking against the party majority." Prokhorova’s resignation comes just months after she took over the leadership of the party from her brother in spring 2014. The Civic Platform was created by Mikhail Prokhorov in 2012. Several months before its creation, the businessman had participated in Russia's presidential elections as an independent candidate, having received 7.98 percent of the votes and a third-place finish. After the elections, Prokhorov decided to form the Civic Platform, a party with a liberal ideology. The party is in favor of reducing the presidential term to four years (it is currently six) and limiting the president to a maximum of two terms in the course of his life (as it stands, the president can only serve two consecutive terms, but can be re-elected later). The party is also in favor of directly electing the heads of the federation's subjects and the local autonomies, and of the population electing the members of the Federation Council on a competitive basis that would have the candidates run freely without any additional filters. Prokhorov declared that the Civic Platform had to become the country's second political force after the governing United Russia party. According to him, it was to be "a compact professional party… and have the right to permit the leaders of civic society to run in elections." 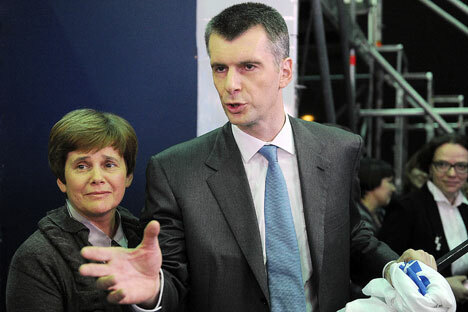 Yet later Prokhorov began to steadily lower his political aspirations. In the summer of 2013 he conspicuously did not run for Moscow mayor and in the spring of 2014 left his post as Civic Platform leader, to be succeeded by his sister. Political analyst Yury Korgunyuk says that with the departure of the Prokhorov brother and sister from the Civic Platform the electorate will lose interest in the party. He believes that no other leader will be able to give the party serious political weight. Korgunyuk believes, however, that “when the country will again need a figure who can consolidate the Russians' oppositional moods,” it is likely that Mikhail Prokhorov will be asked to return to the arena of big politics. “This may happen on the eve of the next Duma elections in 2016," says Korgunyuk. "The Prokhorovs have not completely abandoned the Civic Platform, they have just decided not to lead it. But they are still party members," says coordinator of the party's Moscow division and Moscow City Councilor Mikhail Vyshegorodtsev. According to Vice President of the Center of Political Technologies Alexei Makarkin, it is not necessarily true that the Prokhorovs' abandoning of the party leadership means the Civic Platform will cease to exist. Makarkin believes that the disagreement over the Crimea is only the external reason for Irina Prokhorova's departure. "Currently, the Civic Platform as a national political party does not have any perspectives, whether it is led by the Prokhorov family or not. Liberal opposition is not popular among Russian citizens in general now,” says Makarkin. “The agenda has changed drastically, becoming more anti-western. But it is possible that with time Russians will again be interested in a moderate liberal party," he added.